Enjoy a classic charm, without missing out on modern design. If you want the traditional appearance of a sash window without the expense and upkeep of real timber, contact us today to discuss our high quality uPVC equivalents. They look like timber in the design elements, but they are far less effort to maintain and give far better insulation results. Our top-quality windows are designed to fit most locking systems on the market, giving you peace of mind. The system meets the BS7950:1991 (2007) security standard, which judges the enhanced security performance of domestic windows against intruders. As well as security, we have your peace and comfort in mind. 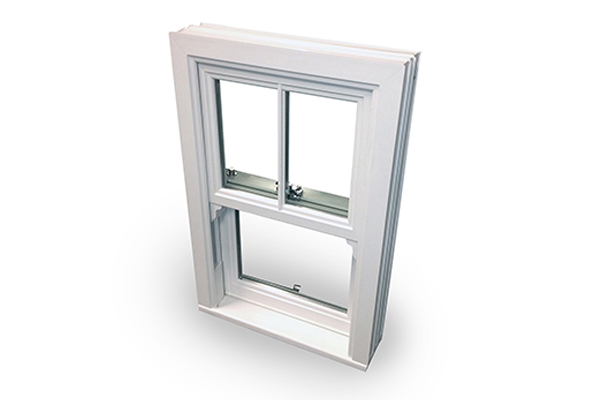 The uPVC sliding sash windows will fit 24mm and 28mm glazing, which is thick double glazing. This, on average, produces an acoustic result of –32 decibels. Our standard sliding window heat efficiency (U-value) is 1.5 W/m2k. The lower the U-value, the better the heat retention. Our uPVC sliding sash windows were developed after extensive consultation with conservation bodies, in order to ensure that we could provide the most authentically appearing uPVC window available in today's market. Ideal for replacing worn-out timber windows, the traditional timber sash feel is reproduced by combining the sight-lines of the 42mm, 52mm or 62mm sash with the 81mm bottom rail. Add classic handles, Georgian bars and heritage run-through horns to complete the look. As well as old-fashioned charm to suit the more lived-in house, these windows benefit from all the up to date modern technology we can provide. This includes a triple chambered profile for increased thermal and sound insulation. The sliding sash windows can reach the highest windows energy rating: A, and the whole system is very low maintenance thanks to the uPVC material. The standard colours we offer for these windows are the classics: White, Rosewood, Golden Oak and Mahogany in a woodgrain style. For the sliding window there is an additional choice of 19 special colours, including the popular White Ash, Anthracite Grey and Cream. Traditional timbers windows were always painted, so White is a good choice for accuracy, but if you want to highlight the similarity to timber with a more natural appearance, choose a woodgrain colour. Our top-quality uPVC sliding sash windows are designed to fit most locking systems on the market, giving you peace of mind. The system meets the BS7950:1991 (2007) security standard, which judges the enhanced security performance of domestic windows against intruders. As well as security, we have your peace and comfort in mind. The sliding sash windows will fit 24mm and 28mm glazing, which is thick double glazing. This, on average, produces an acoustic result of –32 decibels. Our standard sliding window heat efficiency (U-value) is 1.5 W/m2k. The lower the U-value, the better the heat retention. Designed to replace timber sash windows, our uPVC sliding sash windows far exceed timber in longevity and ease of maintenance. uPVC, the material we use in all our windows, will not splinter, warp, or contract and expand with the seasonal temperature changes. It will remain in great condition for years with only the minimum of cleaning required to remove debris. Our uPVC sliding sash windows are available in an extensive range of different styles, which ensures that we can provide the perfect modern replacement for your current timber sash window, no matter what its design. This includes bay style windows and splayed style, and if you order bespoke we can produce striking rarer styles such as True Arch, Gothic Arch and Swept Head. These eye-catching styles have a curved profile and a fixed top sash. The timber mimicry doesn’t stop at woodgrain foils and slimline profiles. We have replicated the decorative features of timber sliding sash windows, including astragal glazing bars, trickle vents, Georgian bars, decorative sash horns, and making sure that our windows can be used with traditional style operating hardware such as handles and locks. The sash section, meeting rail and jambs are also designed in an authentic-looking way. Our 24mm double glazed units operate at peak performance. They are made up of two 4mm panes, with a 16mm airgap for maximum insulation. Some of our windows have specially toughened glass. There are two main advantages to toughened glass: first that it can stand up to much more force and is much more difficult to shatter than untreated glass; secondly, if it does break, it will shatter into tiny pieces. This is much safer than normal glass, which will break into larger jagged pieces and can be a real danger. Cleaning is simple for you too; both sash parts of the window can be tilted inwards for easier cleaning. This is particularly helpful when cleaning in hard to reach areas such as upstairs or conservatories. This mechanism is discreetly hidden away and will not affect the traditional appearance of your uPVC sliding sash windows. For a free, instant and competitive uPVC sliding sash windows quote that is tailored to your specifications, simply visit our online quoting engine today. This system has been specially designed to make things easy for you.